For the month of February, I explored a daily practice of letter writing as an examination of my personal intentions: warmth, connection, presence, patience, admiration. 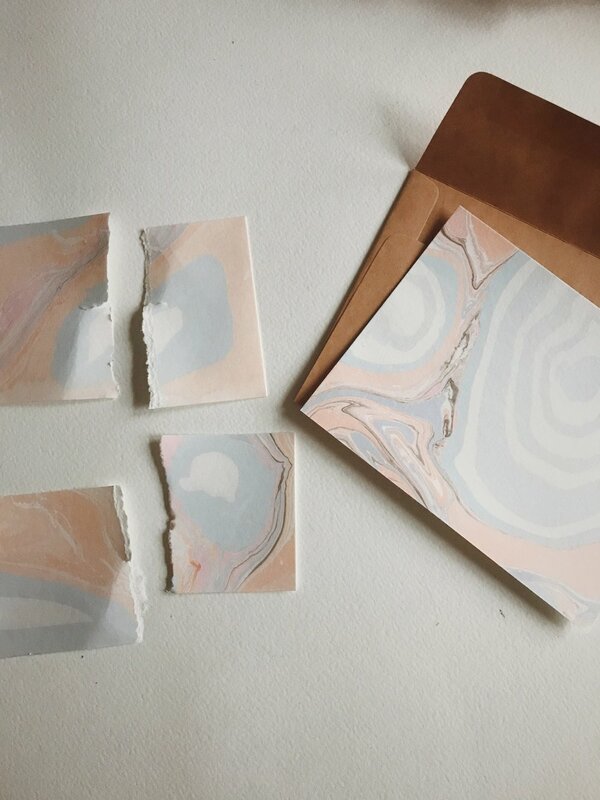 I created 32 marbled cards based on the colors of the sunrise: gray blue, peach, pink, dark gray and orange. Colors referential of the heart. Colors I saw in the sky on my morning commute. Colors I saw in the sky as the sun dipped down past the buildings disappearing into the horizon, colors of a night of storms. Colors that reminded me of the changing nature of the breath, of love, of relating. Colors that reminded me that the sun is a constant but the sky changes and that clouds sometimes obscure the sun's warmth. That the sun and the moon will always circle dance around us, but our ability to see these spheres might be obscured. In this way they ask us to trust in their cycles, have faith in their presence and return. I wanted to write to share connection and truth. To share gratitude and thanks for the very specific lessons each connection brings. Each letter was stamped with a heat-reactive stamp of the total solar eclipse as a reminder of the necessity of warmth and connection, cycles of love, the cycles of the sky. Tied to the moon's cycles, the project started and ended on a full moon, started from an idea born around the time of the summer's eclipse. I learned about trust some more in this process: letters got lost, letters were forced, some letters not sent. I learned about boundaries and forgiveness; some letters I labored over, some letters flowed freely. In all, I wrote and sent 31 letters. I wrote to my family, my immediate core. I wrote to friends I know well and folks I don't know as much. Teachers, all of them, in some way. I wrote not to reminisce but to thank. To give thanks for connection, to acknowledge the unique and sweet joy that each recipient brings to the earth. I learned about healthy parameters. About planning too much and too little. About boundaries. I learned about ritual, practice, and completing a project. Creative abundance. Follow through. I am grateful to this project and its the moments of quiet, for the time away from the glow of my screens. Who are you grateful for? Who do you write to? Spread the love in your own words: we're making marbled cards in June!